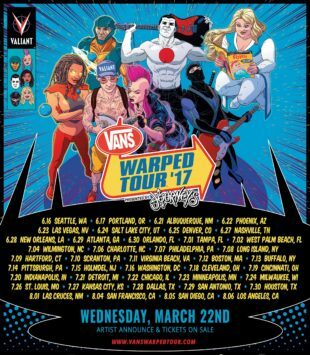 Valiant to Appear at 2017 Vans Warped Tour® Dates in California, New York, Washington, and More – Coming Soon to a Town Near You! Look for more details on Valiant’s selection of Vans Warped Tour®-exclusive merchandise and free giveaways to be revealed soon. In addition to exhibiting with a full-scale convention set-up at these select dates, the collaboration between Valiant and the Vans Warped Tour® presented by Journeys® will continue across the historic tour’s entire summer 2017 season as several of the publisher’s most iconic heroes – including X-O Manowar, Faith, Bloodshot, Livewire, Ninjak, and more – take center stage on the tour’s posters, promotional pieces, merchandise, and more. Additionally, Valiant and the Vans Warped Tour® presented by Journeys® have also arranged for participating comic retailers to exhibit alongside Valiant at any of the tour’s 40+ stops throughout the 2017 season. For more details, retailers should e-mail retailers@valiantentertainment.com and note their store name and closest Vans Warped Tour® 2017 festival date. A complete list of the 2017 Vans Warped Tour® dates can be found here. For more information, visit Valiant onFacebook, Twitter, Tumblr, Instagram, and ValiantUniverse.com.